AirPlane: Airports Venice “Marco Polo” and Treviso “Antonio Canova”. In the Arrival area of the airports, the C.O.L will set up welcoming and information desks. Several ATVO’s shuttle buses for Jesolo will also be available at arranged prices. The schedule will be setup after the closing of the Registrations. Train: San Donà di Piave-Jesolo Station (20 km). The C.O.L will set up a welcoming and information desks. Several ATVO’s shuttle buses for Jesolo will also be available at arranged prices. The schedule will be setup after the closing of the Registrations. Car: For those who come from Milan or from Brennero highway A4, after Mestre’s freeway take the exit towards Aeroporto Tessera/Jesolo. For those who come from Mestre’s bypass, take the exit towards Noventa di Piave and the connection to Jesolo. For those who come from Tarvisio, Udine, Trieste highway A4, take the exit towards Noventa di Piave and the connection to Jesolo. Train: Portogruaro-Caorle Station (25 km). The C.O.L will set up a welcoming and information desks. Several ATVO’s shuttle buses for Jesolo will also be available at arranged prices. The schedule will be setup after the closing of the Registrations. Car: For those who come from Milan or Brennero highway A4 towards Trieste, take the exit San Stino di Livenza and continue on Strada Provinciale 59 towards Caorle. For those who come from Tarvisio, Udine, Trieste highway A4, take the exit Portogruaro and continue on Strada Provinciale 68 towards Caorle. Train: San Donà di Piave-Jesolo Station (22 km). The C.O.L will set up a welcoming and information desks. Several ATVO’s shuttle buses for Jesolo will also be available at arranged prices. The schedule will be setup after the closing of the Registrations. Car: For those who come from Milan or Brennero highway A4, after Mestre’s freeway, take the exit towards Aeroporto Tessera/Jesolo and continue on Strada Provinciale 47 towards Eraclea Mare. 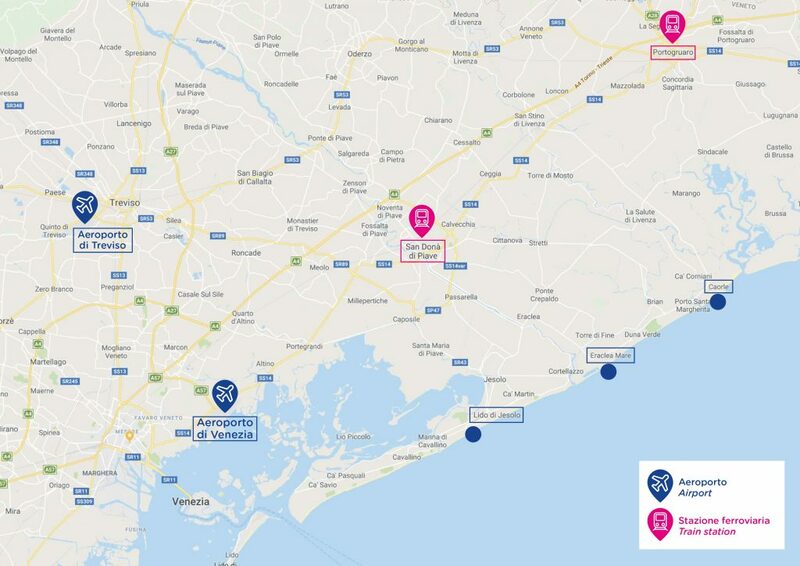 For those who come from Mestre’s bypass, take the exit Noventa di Piave and the connection towards Jesolo and continue on the Strada Provinciale 47 towards Eraclea Mare. For those who come from Tarvisio, Udine, Trieste highwaty A4, take the exit towards Noventa di Piave and Jesolo’s bypass and continue on Strada Provinciale 47 towards Eraclea Mare.